Tottenham Court Road is about 200 metres away, and enjoys service from both the Central Line and the Northern Line. There are a variety of buses that stop on Tottenham Court Road or Charing Cross Road (the closer stops) that you can take advantage of, but aim for Tottenham Court Road at the corner of Oxford Street . There are a number of car parks available in the area, but they are quite expensive at around £10-12 for 2 hours, or £8.40 for 2 hours on a meter. There are a number of cycle racks where you can chain your bicycle up, one at the church on St Giles High Street, about 80 metres from the school which normally has spaces. 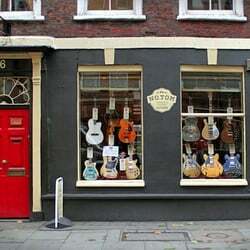 Once you’ve arrived in Denmark Street you’ll find us at number 6 in the same building as NO.TOM Vintage & Clasic Guitar shop on the right from Charing Cross Road.